If you don't know what this is about, read these two articles: one - two. We sell more shirts at Downhill Battle. Also see Claire Chanel's Stop Stop Stop Snitching. + These are black American Apparel t-shirts. + This is a limited run and will not be re-printed. Medium has already sold out. + I will ship shirts first-class mail within two days of your order. 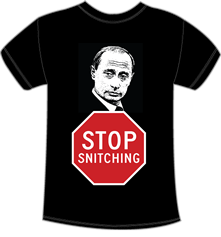 + If you are ordering outside of USA / Canada, please use paypal to send an additional payment of $10 per shirt to putinstopsnitching@gmail.com. + If you are ordering multiple shirts in multiple sizes, either place separate orders or specify sizes in the comment field on the paypal payment page. Questions or comments? Email me - putinstopsnitching@gmail.com.